“One idiot, 3,800 miles, & an electric motorcycle with a 42-mile range. What could possibly go wrong?”, Nathan Abbott wrote on his blog just before he started his cross country adventure on wheels across the US. Just before Rob and myself embarked on our Kumara Parvatha trek I also thought on similar lines "Two idiots, 26 kilometers on foot over an altitude of 1700 meters in two days. What could possibly go wrong?". Nathan met with an accident - no fault of his own - and we made few blunders out of our own stupidity! 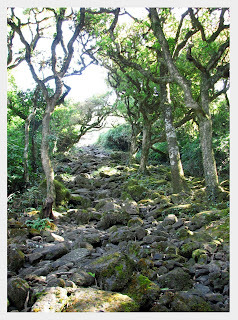 Emboldened by the Himalayan experience we considered this trek a walk in the park, even after reading in numerous blogs that KP is one of the most difficult treks in Karnataka. Nature has its own way of humbling bloated egos and we got a good taste of it. 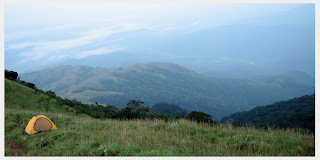 Kumara Parvatha(1,712m) is the tallest peak in the Pushpagiri ranges of the Western Ghats. You can climb KP either from Somwarpet or Subramanya. 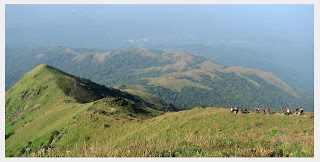 The Subramanya route is longer and is about 13 kilometers from Kukke Subramanya temple, the starting point of the trek. We decided to take the longer route and started from Bangalore on Friday night by Mangalore Express. The first mistake we did was not to book the tickets for our onward journey, and finally ended up sharing the space next to the toilet with a few other people. Imagine two 6 foot, 80 kilo guys squeezed into a four feet wide passage. Eager to get some sleep, we took out some plastic sheets, spread them on the floor and tried not to get disturbed by those who passed over us on their way to the loo. The stink was an issue for some time, but then if you have to sleep, you have to sleep. We reached Subramanya by 6 in the morning and took a shared jeep from the station to Kukke Subramanya for Rs. 20 per head. This temple is dedicated to the snake god; courtesy King Cobras, which are abundant in the dense forests in this part of the Western Ghats. After performing our morning chores at the KSRTC bus station, we had a quick breakfast, packed some lunch and started our trek by 8:30. A right turn from the temple street, half a kilometer of tarred road, and you reach the deviation to Kumara Parvatha. The first four kilometers is through dense forest and in-spite of the canopy we were sweating profusely in no time. Then we realized another stupid thing we did - we just had two liters of water and the next water source was six kilometers ahead! Adding to the misery, we soon spotted leeches, a lot of them marching towards us from all directions. We took out the tobacco and stuffed our shoes with generous quantities, only to realize later that we are not the only organisms with brains. The leeches simply stopped getting inside the shoes and instead started attacking other parts of the leg. Both of us got a couple of leech bites in the next few hours. Rob even got one behind his knees, which he realized only after seeing the blood, and you can imagine how stealthily and efficiently these guys operate. Fortunately we did not run into their bigger cousins, the Cobras. We took an hour long break around 12:30 for lunch and a quick nap. Our first destination was Bhattar Mane, the house and orchard of Narayan Bhat, halfway through the climb. 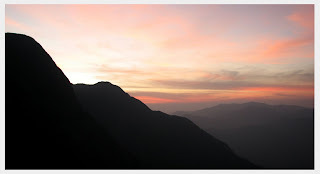 The Bhat family provides food and shelter for trekkers at a nominal price. Narayan Bhat migrated to this place from Kasargod about 37 years back, and speaks Kannada, Malayalam and English. He grows Arecanut, Plantain, Lemons and a variety of vegetables. We met another group of three trekkers at Bhat's house. We refilled our water bottles, paid the camping fees -Rs. 115 per head- at the Forest Dept. office near Bhat's house, and resumed our journey. It took about five hours for us to reach Bhatare mane and had another 6 kilometers ahead of us to the peak. Soon we were treated with breathtaking views of the Pushpagiri range of mountains. While climbing from Subramanya side you have to cross two mountains -Battadarashi and Seshaparvatha- before reaching Kumara Parvatha. There is a stone 'Mantapa' near Battadarashi, and there is a stream before that which is a source for drinking water. We took a short break at the mantapa and decided to try our luck climbing the rest of the peak before night fall. But later we decided to pitch our tent near a small hillock between Battadarashi and Seshaparvatha. It was getting cold, dark and windy already and we had a great view from our tent. It was great sitting under the starry sky and have bacon, ham and bread for dinner! We had some serious discussions on where to keep the leftover food; just in case some animals sniff out the meat and decide instead to feast on some fresh meat that is us. Soon we crept inside the comfort of sleeping bags inside the tent and decided to catch up on sleep. 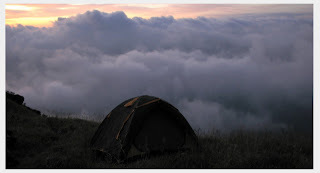 There was no perfect plain land to pitch the tent and we were literally sleeping along a slope. Soon heavy winds started blowing and it was the weight of us inside the tent that prevented it from being flown off the hill. A couple of times during the night I woke up as Rob shouted 'who's out there'. The tent flaps fluttering in the wind made us think that someone/something is walking outside. We woke up by 5 in the morning and the moon was still out, lighting up the beautiful landscape all around. I don't know how to put in words the feeling you get when you see clouds floating around your doorstep, shining bright in the moonlight. We climbed up Battadarashi peak at 5:20 in the morning and stood there watching the sun slowly coming out of its slumber. It is an awesome sight to watch the sky changing colors, from grey to red to orange to a fine blue. The group we met at Bhat's place had camped just across the hillock and we had a chat with our 'neighbors' who joined us on the peak. After a quick breakfast we rolled up the tent and resumed our journey. As you cross Battadarashi, the first peak, Seshaparvatha will look like the tallest peak, only to realise as you reach the top that both KP and Sidhaparvatha are taller than it. 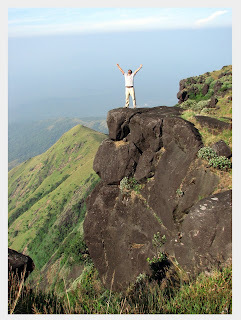 Sidhaparvatha is a rocky cliff you find between KP and Seshaparvatha and looks inaccessible. Seshaparvatha offers some great views in all directions. The path we walked looked like a huge snake, crawling around all the hills and valleys. KP is another 45 minutes from Seshaparvatha. We walked through some beautiful shola forests for about 20 minutes till we reached a stream. From there we followed the stream to a waterfall, which fortunately had very little water at this time of the year. You must be thinking what is the fun in having a waterfall without any water. I said fortunate because we had to climb up this waterfall, which cascades down a rock at an 80 degree elevation! I am sure it would be great fun to climb this rock against the gushing water during the monsoons; another reason to visit KP again. The peak is about half a kilometer from this steep rock and is wide enough to accommodate a few hundred people. There is a small temple on the peak, made out of stacked stones. We had a good time wandering around the place and having the last pieces of bread we had with us. It was sad to see the peak littered with plastic bottles, beer cans and other junk. We expect a certain level of commonsense and decency from the kind of people who go trekking out of the love of nature; but there will always be some a**hole who screws up. Our plan was to reach Bhattar mane for lunch and hence started our descend carrying a bag full of water bottles and other junk from the peak. Climbing down was not a joke, in fact it was more strenuous than the ascent. If you need a good pair of lungs to manage the climb, you need an extraordinary pair of legs to take the pounding and get down in one piece. By the time we reached Bhattar mane, we could not even feel parts of our legs. The plain rice, sambar and pickle at Bhat's house was ambrosia for our hungry stomachs. After a couple of servings of rice and some much needed rest, we started for Subramanya. It took us about two hours to cover the 6 kilometers and we checked into a hotel as soon as we reached the town. Rob had to travel to Puthur the next morning and hence decided to stay back at Subramanya that night. I took a shower and got into the 9:15 bus to Bangalore. Though it was a bumpy ride, I slept like a baby, much to the surprise of my co-passengers, who shouted at the driver every 5 minutes as he maneuvered the vehicle from one pothole to the other. I reached Bangalore by 5 in the morning and was under the blankets by 6, for a couple more hours of sleep. The pain in the legs might go away in a day or two, but the memories will remain for a long time to come; at least till my next visit to KP. Is that you in the picture or Rob on top of the world and reaching up to the heavens? Pure joy! And its Rob in that picture. Nobody gets too much heaven no more and this is the closest we could get ! An excellent read. This is Subhrajit from www.adventureclicknblog.com and we would love to have your blogs listed in our website. We are trying to capture all the adventure blogs at one place. We would love to have contributions from you. Our team can design them post it uner your profile. We have also launched a credit system for contributions by which contributors can reimburse the points for cool travel stuffs (adventureclicknblog.com/moreblognearn.php). The credit points are a way of saying thank you for your sincere effort and time for writing.